The impromptu visit of the Indian prime minister to Lahore on his way back from Kabul took everyone, including the Indian media, by surprise. Both the Indian public and the media sang praises for the statesmanship shown by both Narendra Modi and Nawaz Sharif for initiating confidence-building measures to put the peace process back on track. Nawaz broke protocol by receiving Modi at the airport and also seeing him off. Similarly, all leading newspapers of Pakistan welcomed Modi’s visit to Lahore in the hope that the stalled peace dialogue would be resumed in the interest of both the countries. 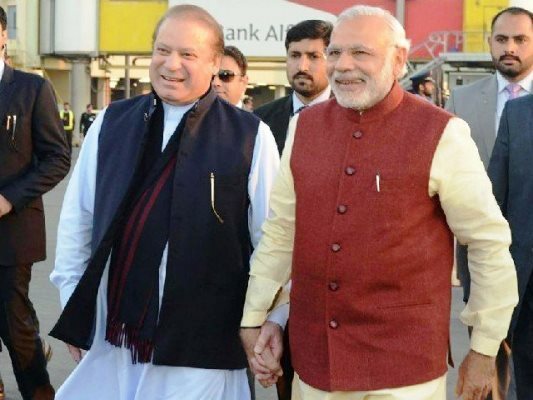 Nawaz Sharif greets Narendra Modi in Lahore, Pakistan. Just when our expectations of restoring normalcy between the two neighbours were beginning to take shape, the unfortunate incident in Pathankot happened. 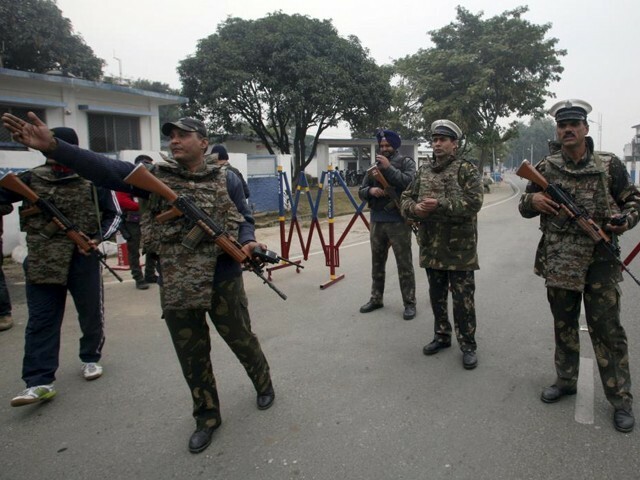 An Indian Air Force base was attacked by militants and nearly 11 people died. It is reminiscent of the famous bus trip of India’s former Prime Minister Atal Behari Vajpayee to Pakistan, which culminated in the Lahore declaration. It was immediately followed by the Kargil incident. The former Army General and President of Pakistan, Pervez Musharraf, allegedly admitted his role in formulating the Kargil strategy. 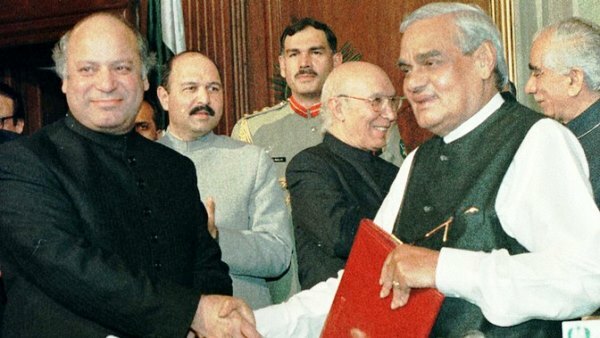 Pakistani Prime Minister Nawaz Sharif (L) and his Indian counterpart Atal Behari Vajpayee greet each other after signing a memorandum of understanding named “Lahore Declaration” in Lahore on 21 February 1999. It seems that the history of the Pak-India relationship is doomed to repeat itself. This time around, the attempt made by Modi to break the political logjam by his visit to Lahore is being overshadowed by the Pathankot incident. Incidentally, on both occasions, Nawaz was the prime minister of Pakistan! This raises the question: Are there forces in Pakistan which do not want Nawaz Sharif to succeed? We are seeing a method to the madness in all the peace talks. All attempts to restore normalcy are followed by either terrorist attacks or escalation at the borders giving one the impression that certain vested interests do not want India and Pakistan to remain as good neighbours. According to a leading Indian newspaper, the slain Punjabi-speaking terrorists – part of Jaish-e-Muhammed, based in Pakistan’s Bahawalpur – were taking instructions from their handlers, Maulana Ashfaq and Haji Abdul Shaqur. There is also a growing belief in India, rightly or wrongly, that the Pakistani Army is inimical to good relations between the two neighbours, as they fear that India poses an existential threat to Pakistan. Secondly, they feel that unless the core issue of Kashmir is put on agenda, every attempt would be made by both state and non-state actors to derail the peace process. However, one question that begs an answer is, how did they manage to cross the well-guarded border? Are there elements in India which could have facilitated their entry? There are no easy answers, unless both the countries agree to work in tandem, to investigate into the matter and go all out to crush the forces that do not want both the countries to live in peace. There is a developing fear in India that the Pathankot attack will once again derail the peace process between the two countries. Moreover, the opposition parties in India will give Modi a hard time for trying to restore normalcy with Pakistan. It is my earnest hope that Modi does not succumb to any pressures from the opposition parties and continues to engage with Pakistan. However, unlike the past, the Indian prime minister should go for a well thought-out approach while talking with his counterpart in Pakistan. Firstly, India should continue to work on its relationship with Pakistan despite the unfortunate Pathankot incident, as any attempt to stall the peace talks will only result in strengthening the agents of discord. Secondly, the Indian prime minister should insist including the Pakistani Army in all future dialogue processes, as we have seen in the past, merely engaging with the civilian government has not helped. India shouldn’t hesitate from opening direct channels of communication with Rawalpindi. Thirdly, both the countries should focus on improving cultural ties through people to people contacts, visits of artists, improving trade for creating a climate of trust for all future talks. Lastly, both the countries should work closely to share intelligence and combat terrorism, which has caused havoc on both sides of the border. With the threat of ISIS expanding its operations in South Asia, this partnership can work in ensuring that the terrorist organisation does not spread its tentacles in the region. The aforementioned suggestions may sound utopian but they offer solutions for improving the relations between the two countries. Both the countries should realise that if attempts to stop the process of dialogue are successful, then they will remain in a state of perpetual enmity. That would be a terrible way to start the new year.